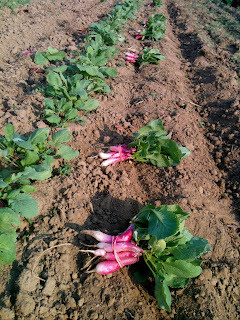 When I think of the radish...I think of a simple salad item (an attractive salad item...but a simple one). Dare I say...an unnecessary salad item. I mean it's not like when presented with a radish-less salad you say, "Hold it! Where are the radishes! OMG this salad has no radishes...what shall I do?!?!" However radishes have so much potential! So many more uses than salad's third wheel....and one of our Buying Club members is kind enough to share his favorite way to enjoy them! Recipe Shared by Paul D.
"The promised Roasted Radish & Potato Salad recipe; it is very good hot or cold. I'll add your beets to the mix on the rare occasion when I don't roast them on the grill. preheat oven to 425 with baking sheet inside. For the vinaigrette whisk together vinegar, olive oil, Dijon, parsley and dill until combined, set aside. For the salad, toss radishes, potatoes olive oil salt & pepper in a large bowl to coat. Transfer to hot baking sheet in the oven. Roast until golden, 20-30 minutes, stirring halfway through roasting. Stir radish greens into roasted radishes and potatoes; return to oven for 2 more minutes. Transfer roasted mixture to large bowl and toss with vinaigrette and scallions until all ingredients are coated.